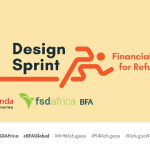 In June 2018, BFA, a global consulting firm led a four-day design sprint for financial service providers (FSPs) to develop and test solutions tailored to over 1.3 million forcibly displaced people (FDPs) in Uganda. This was the latest engagement in a multi-phase program by FSD Uganda and FSD Africa to increase awareness and create financial services for forcibly displaced people. 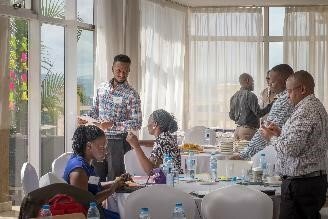 It was the second refugee-focused design sprint in the FSD Network, the first having been held in Rwanda. 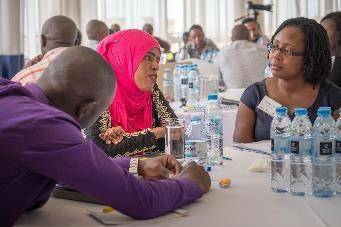 Preceding activities included a roundtable discussion with financial service providers in Uganda in December 2017 and a series of customer journey-mapping workshops in Uganda in April 2018. Through these engagements, a number of major FSPs in each market are gaining a better understanding of the needs and capabilities of refugees and identifying pathways to improving financial products and services for refugees as new customers. 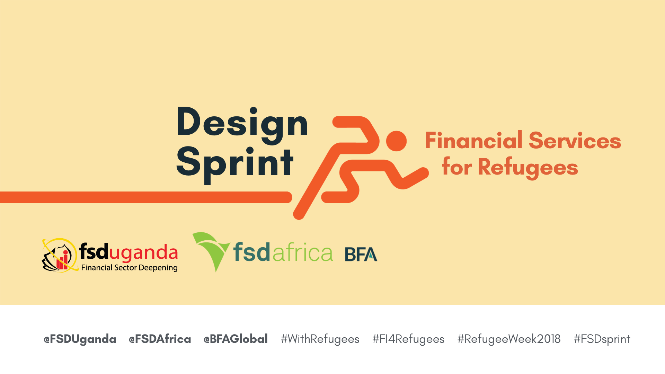 Building on this momentum, FSD Uganda opened a call for financial sector actors to participate in a design sprint, a rapid customer-centered product development process, to transform insights into actionable solutions for refugees. FSD Uganda received over 20 applications and selected a final cohort of six sprinters from three major banks (dfcu Bank, Bank of Africa, and Post Bank Uganda), one fintech (EzeeMoney), an MFI (Rural Finance Initiative) and a refugee-centered NGO (NEW Foundation). Over four days, the six teams of three from each institution met both urban and rural refugees, generated new ideas for products and services, built scrappy prototypes, visited a refugee settlement to test ideas and gather feedback, and finally delivered pitches for their proposed solutions. Refugees can speak directly to providers about their challenges in accessing and using financial services, hence providing insights to specific hurdles that are often unknown to the FSPs. By learning from refugees and visiting a refugee settlement, participants are inspired to generate new ideas, build/test improvements, receive immediate feedback from potential customers, and even explore new business lines. Providers increase their skills and capacity around product innovation, learn new approaches and methods used by successful companies, as well as apply and adapt these methods to the local context. What did the sprinters discover? 1. Many refugees are economically viable, building on a range of experiences as entrepreneurs and business people. When the teams visited Kyangwali, they discovered cases of high-performing refugees who were earning and managing large sums of money. According to the UNHCR sub-office Livelihoods staff, 92 percent of Kyangwali refugees engage in agriculture as a livelihood, given the abundant maize gardens seen throughout the settlement. Most residents receive monthly remittances and benefits from relief programs. This means that many refugee households have active and, in some cases, substantial financial flows, mainly in cash. The teams were so impressed with the refugees they met as Michael Mwesigwa of DFCU Bank remarked: “There are strong business cases here. These settlements show more economic activity than many villages in Uganda. And when refugees are storing UGX 10, 20, or 50 million of cash in boxes—any bank would die to hear this.” In addition, providers were reminded that when they deliver services to refugee settlements, they should be able to serve the rural host communities as well, reaching more people and diversifying the types of customers for the institutions. 2. Refugees have a strong desire to use formal financial services, but trust is low after past rejections by banks and changing requirements by other providers. When it comes to saving and managing their money, refugees expressed a strong desire to access and use formal financial services, but where they have tried accessing banks, they found complications and rejections. “They say, ‘It’s not you,’ even when I show my refugee ID,” said a Somali woman who had tried to open a bank account to save her money. While many banks now accept refugee IDs—including banks in the sprint teams—it seemed as though this refugee had faced rejection too many times. We could hear the discouragement and distrust in her voice. When a team member encouraged her to try again, it was unclear whether she would take the time to visit a bank and risk failure once again. Policies are improving to expand access to refugees, including through the efforts of FSD Uganda and other refugee advocates. Some of the changes have included the use of refugee IDs as a requirement to register for a SIM card (as opposed to just the national ID or passport). Yet this remains a complex and evolving policy landscape, and there is a strong need to increase awareness, rebuild trust, and improve financial empowerment among refugees in order for the dream of access to be realized. 3. Refugees actively use savings groups such as VSLAs, but group limits can stunt the financial growth of refugees. The teams heard again and again about the importance of groups: nearly all the refugees they spoke to are members of one or more savings group. But these informal, cash-based savings groups have limits to the amount of capital they can collect especially when compared to the credit needs of nascent businesses, the sizes of the loans that savings groups can issue are often insufficient. All six provider teams noted the potential opportunity of working through these established and trusted group structures to more effectively reach and serve refugees with formal financial services. 4. Security is a key concern for refugees. Since refugees’ savings groups are informal and operate in cash, the teams inevitably heard stories of theft of savings and broken lockboxes. In addition to the difficulty in accessing mobile-money agents, some refugees believe mobile money is not adequate or secure enough for saving their money. The bank agent requirements in Uganda stipulate the need for secure premises. If an agent in a settlement fulfills these requirements, it will mean greater safety. 5. Last-mile challenges prevent rural refugees from accessing and actively using formal financial services. Kyangwali refugee settlement is located 3-4 hours away from the nearest town Hoima, and other refugee settlements are even more remote. Refugees living in these areas face last-mile challenges getting to markets to sell their goods and accessing the nearest bank branch or mobile-money agent. A Kyangwali farmer might earn UGX 50,000 in Hoima, yet a roundtrip to the market and back costs UGX 30,000, the last mile nearly costing the refugee their last shilling. The last mile presents challenges to providers too, as it’s costly to open bank branches, set up agent networks, and service/maintain these distribution channels. 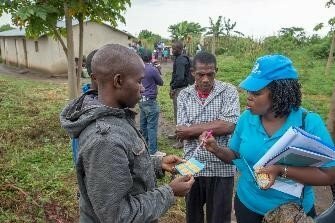 These challenges are outlined in a report by UNCDF, UNHCR, and BFA, “Uganda country assessment on affordable and accessible remittance for forcibly displaced persons and host communities.” The report and the design sprint teams also explored potential solutions and new approaches to these challenges. From Rwanda to Uganda: What have we learned? While some participants in Rwanda saw each other as competitors, in Uganda some teams explored potential partnerships. We believe this approach could greatly benefit refugees, as NGOs with experience in serving rural refugees could help banks tailor their products, other partners could help build agent networks, and the banks could enable non-licensed partners to provide financial services. With the right products and pricing, these partnerships could have the potential to deliver financial services at scale. Both Rwanda and Uganda have progressive policies toward refugees. Uganda also grants parcels of land to refugees, allowing them to earn additional income, whereas refugees in Rwanda could only have small kitchen gardens. At Kyangwali, the sprinters witnessed how this policy enabled a robust agricultural livelihood that benefitted not only the refugees themselves but contributed to the economy and food systems of the host community and beyond. The Kyangwali refugees’ chairman and UNHCR hosts proudly noted that 25% of the agriculture produce sold in Hoima markets comes from refugee farmers in the settlement. During the design sprint, Rwandan providers focused more on improving existing financial products by better understanding refugees, tailoring their products to meet their needs, and increasing awareness and trust in order to reach these new customers. Ugandan providers diverged to explore more new ideas, adapting to recent changes such as agent networks, and addressing persistent distribution challenges. Many converged to focus on highly feasible and near-term solutions, but some of the new ideas and visionary thinking remained in the teams’ roadmaps. 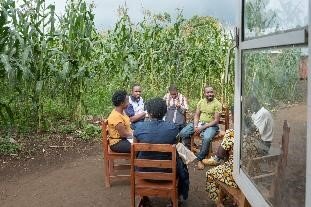 In Rwanda, providers were able to interview refugees at a settlement, build prototypes, and go back to the same community of refugees to gather feedback. This allowed for greater consistency in the testing process by identifying needs and testing prototypes against those same needs. It also enabled respondents to think about solutions further, providing more informed input and feedback throughout the design process. However, in Uganda the distances to refugee settlements are substantial, so the teams first spoke to urban refugees in Kampala and then with rural refugees in Kyangwali, exposing them to different types of refugees. The providers were made aware of the diverse range of refugees in Uganda, as well as how the segments, livelihoods, and community dynamics at Kyangwali—one of the oldest and most established settlements—differ from newer refugee settlements located in northern Uganda. 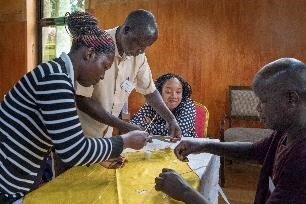 Conversely, the team from RUFI noted that they’ve primarily served South Sudanese refugees in the north, so they requested to speak with other types of refugees to understand their needs and test prototype financial solutions with other refugee segments, geographies, and settlements in Uganda. Learning is great, but where’s the action? During the sprint, all six teams developed prototypes of improved solutions for refugees, ideas that included tools to digitize savings groups, multi-wallet bank cards, mobile-banking vans with free WiFi, and remittance-centered bank accounts. With each interview they learned what worked and what didn’t for the rural refugees, sparking ideas for new improvements and driving excitement for next steps. “Why are banks and other financial services providers not already here?” remarked Yengi Lokule from Rural Finance Initiative, the MFI already serving refugees in Northern Uganda. “There is so much potential,” he added. At the end of the sprint, the six teams were able to pitch their final ideas to FSD Uganda, FSDA and UNHCR, capping four days of rapid ideation, learning, and testing. 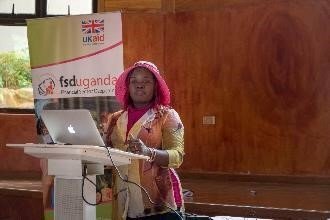 FSD Uganda announced plans for further grant funding to support financial service providers in Uganda to develop innovative refugee-centered financial services and will release a request for proposals in Q3/Q4 2018. Furthermore, the sprinters were urged to pursue their ideas irrespective of the outcome of the grant award. As we witnessed, refugees need—and demand—financial services now, so providers were encouraged not to wait to begin developing and implementing their product plans. More than one team expressed plans to move forward using their own resources in the interim to meet the business opportunity to serve refugees. Over the course of four days, as our 20+ sprinters changed from trim office attire and into sneakers that became caked in dirt, as they made the long journey from Kampala to Kyangwali—and got stuck in the mud literally —we began to see broader changes happening. We observed providers’ attitudes change about the viability of serving refugees, we saw them explore out-of-the-box fixes to persistent problems, and we were moved by a fiery conviction they voiced about the need to innovate for refugees. The six financial service providers began to see refugees and forcibly displaced people as potential highly valued and loyal customers and product development could not wait. Providers should be racing to capture this untapped market by delivering refugee-centered financial products of the highest quality. 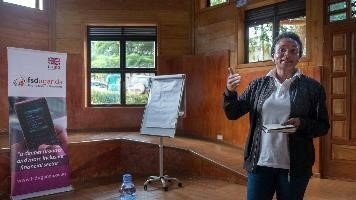 This four-day experience gave us a glimpse of what we could achieve if we sprint toward a future where forcibly displaced people have the financial services they need in order to thrive. BFA is a global consulting firm specializing in financial services for low-income people. BFA’s approach is to seek out, create and implement financial solutions to help people manage challenges and seize opportunities. BFA partners with cutting-edge organizations that touch the lives of low-income customers such as financial institutions, fintech companies and information providers. In creating solutions, the firm integrates deep expertise in customer insights, business strategy, new technology, and growth-enabling policy and regulation. Founded in 2006, BFA’s clients include donors, investors, financial institutions, policymakers, insurers and payment service providers. BFA has offices in Boston, New York, Nairobi and Medellín. For more information, please visit: www.bfaglobal.com.